The undead are terrifying foes, known for their tireless strength and single-minded purpose, but no less terrifying is the fact that each of the champions leading Waiqar’s hosts possesses centuries of experience in military tactics and strategy. These military geniuses support their battle plans with the steady, inexorable beat of skeletal drummers and the sinister sigils raised by the gaunt standard-bearers. And perhaps worst of all, necromancers stalk the ranks of Waiqar’s army, raising the fallen to fight again in the name of their lord. 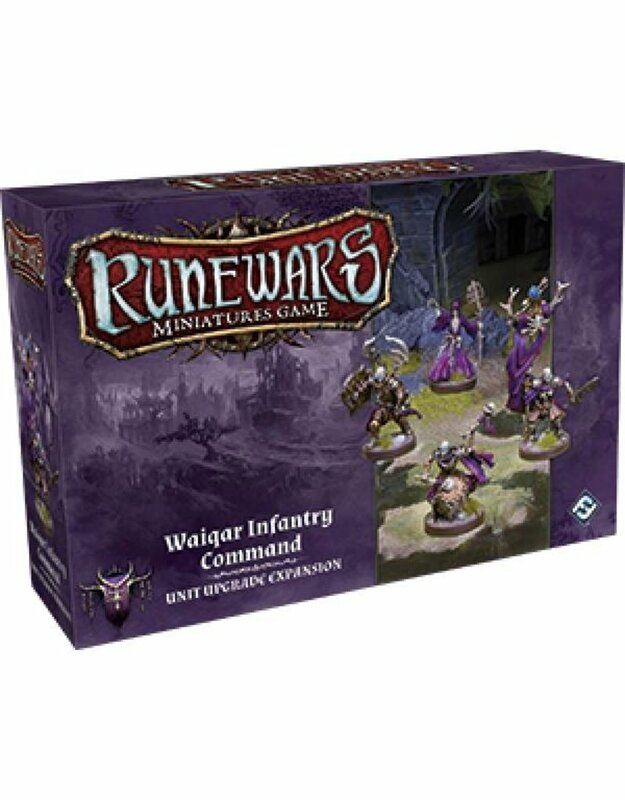 In the same fashion as the Daqan Infantry Command Unit Upgrade Expansion, this expansion pack offers four new figures that you may add to an infantry unit: a Standard-Bearer, a Champion, a Drummer, and a Necromancer. With eighteen new upgrade cards to increase your army’s power, you’ll find plenty of ways to add these figures to your units, perhaps adding a Marching Drummer who lets your unit turn freely, so long as the Drummer remains with the unit.